Ender's Game is the winner of the 1985 Nebula Award for Best Novel, the 1986 Hugo Award for Best Novel, and a 2013 Major Motion Picture. In order to develop a secure defense against a hostile alien race's next attack, government agencies breed child geniuses and train them as soldiers. A brilliant young boy, Andrew "Ender" Wiggin lives with his kind but distant parents, his sadistic brother Peter, and the person he loves more than anyone else, his sister Valentine. Peter and Valentine were candidates for the soldier-training program but didn't make the cut-- young Ender is the Wiggin drafted to the orbiting Battle School for rigorous military training. Ender's skills make him a leader in school and respected in the Battle Room, where children play at mock battles in zero gravity. Yet, growing up in an artificial community of young soldiers causes Ender to suffer greatly from isolation, rivalry from his peers, pressure from the adult teachers, and an unsettling fear of the alien invaders. His psychological battles include loneliness, fear that he is becoming like the cruel brother he remembers, and fanning the flames of devotion to his beloved sister. 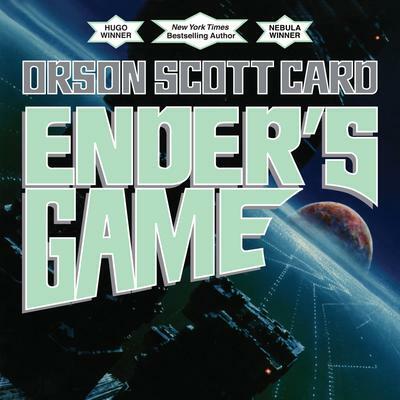 Orson Scott Card is the bestselling author best known for the classic Ender's Game, Ender's Shadow and other novels in the Ender universe. He was awarded the 2008 Margaret A. Edwards Award for lifetime achievement in Young Adult literature from the American Library Association. Card has written sixty-one books, assorted plays, comics, and essays and newspaper columns. His work has won multiple awards, including back-to-back wins of the Hugo and the Nebula Awards-- the only author to have done so in consecutive years. His titles have also landed on 'best of' lists and been adopted by cities, universities and libraries for reading programs. The Ender novels have inspired a Marvel Comics series, a video game from Chair Entertainment, and a 2013 film adaptation. Card offers writing workshops from time to time and occasionally teaches writing and literature at universities. Orson Scott Card currently lives with his family in Greensboro, NC.